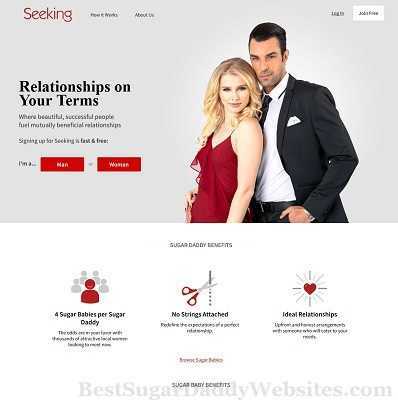 Seeking.com was founded in 2005, is one of the oldest sugar daddy dating sites. It declares themselves as an "arrangement" website. They focus on offering "mutually beneficial relationship" while other sites continue to offer a stage for long-lasting and passionate relationship. There are over 10 million members on Seeking.com. It's the largest comprehensive sugar daddy dating site, and not like SugarDaddyMeet.com which is a straight sugar daddy dating site. Sugar daddies, sugar mommas, female sugar babies, male sugar babies, gay sugar daddies are welcome there. They put forward the concept of "mutually beneficial relationship" firstly. It's a great online community for successful and wealthy sugar daddies & sugar mommas looking to support and pamper sugar babies who will treat them like a king & queen. On the other hand, there are many sugar babies. Struggling in the early part of their career. Want good living and finer things in life. Looking for a mature partner to pamper, mentor and take care of you - perhaps financially. That's what called "mutually beneficial". This website is so popular that Wall Street Journal, CNN, Forbes and several other media channels reporting it. College students can use all the site features freely. Note: Prices are subject to change. Kindly visit the website to know the latest subscription rates. Add photos to 'public photos' album to show your lifestyle. Add photos to 'private photos' album to protect your privacy. Join community to learn more dating experiences. Gift wishlist can help sugar daddies know what gift to buy for sugar babies who they are interested in. Advanced search in local with other key words, such as income, body type, photos only, etc. View newest members / featured members / premium members. View who has interested in you / viewed you / favorited you. Favorite someone to let him / her to know your heart. Exchange emails to know each other better. Seeking.com is an arrangement relationship site. There are many complicated relationship types on this site. A sugar baby may originally have the idea of seeking a wealthy sugar daddy. But a sugar momma is exceptionally interested in you and never stop messaging you. But it’s not important, the most important point is that you are actually very charming. Aren't you? There are 10 million + members from all over the world. This site is very active and you will definitely get much attention from others. Costs of this site is the highest among all the dating sites. It’s the 3 times of some other websites. That’s why it’s not the first one of the top 10 sugar daddy sites. However, your choices are multiple due to its large dating database. So, the successful matchmaking ratio is also very high. It’s a double-edged sword. The design of this website is very simple and clean, not crowded. There are very few features on this site. My account page mainly displays three recommended members list including featured members, background members, premium members to people come to this site. It’s easy to find suitable object without wasting time on searching. Seeking is a mobile-friendly site with its own apps. No matter what devices you use to log in the website, it’s very convenient to use. Copyright © 2019, BestSugarDaddyWebsites.com - The Best Sugar Daddy Dating Websites Reviews.